How could I have missed this? For years I lived right across from Beacon Hill Park! I celebrated their fabulous meadows every spring. Daffodils & tulips in March & April; later the camas meadows in May…. 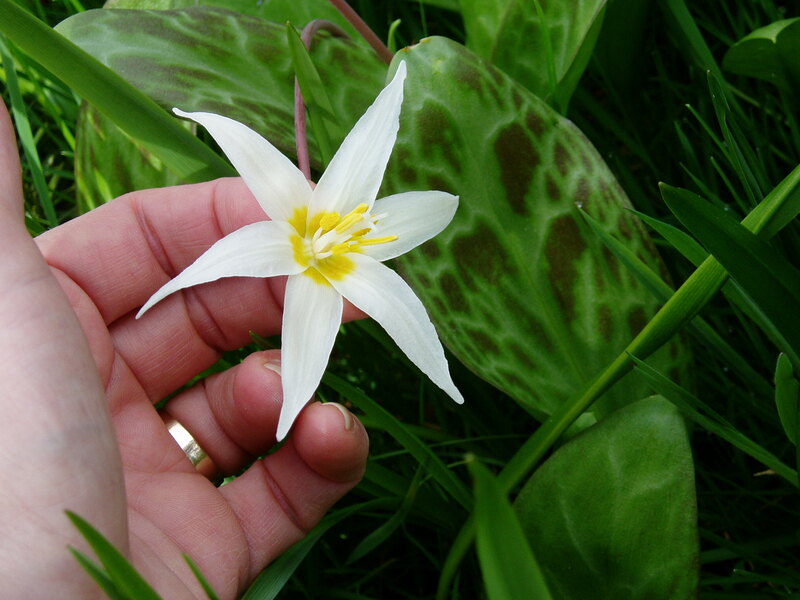 But somehow this Fawn Lily meadow had eluded me – until now! 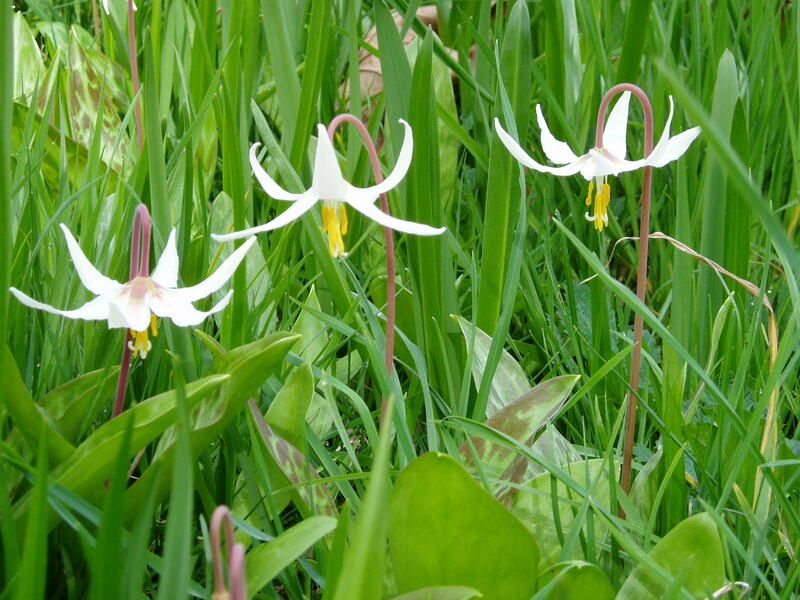 Since then I’ve noticed fawn lilies along the trail around Cedar Hill Golf Course, too. Later, I was delighted to discover them growing wild in the backyard at the Cedar Hill Road house. 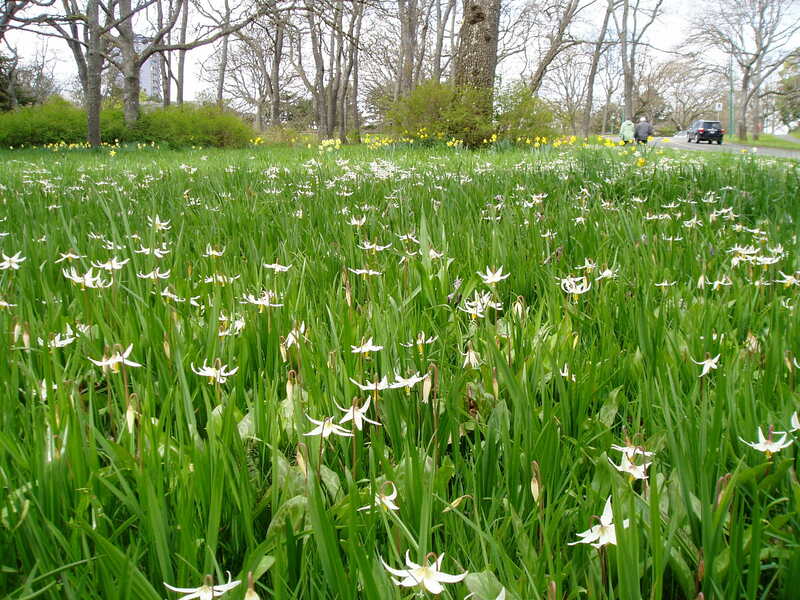 Of course, when we planned our move to the Richmond house, it was IMPORTANT to bring some of those fawn lilies with me to the next yard. They had such long taps (6 inches or more) that led down to thin, elongated bulbs. They were really tricky. Most broke off & stayed rooted where they grew, but I did get a few. Only a couple survived the transplant trauma. The 2 successful specimens are in the border near the driveway. For the first 3 years, they just produced leaves. Last year one bloomed! I’m coddling them (go figure). I’ve also been buying seeds from the Swan Lake Nature Sanctuary & scattering those willy-nilly. So far, no luck, but I have dreams. One gardener from the Native Plant Study Group tells me that she seeds them into trays & lets them sit outside for a couple of years. That way they’re easier to identify when they come up, & she doesn’t weed out the tiny babies by mistake. She’ll eventually be able to move them into her beds to naturalize.